Web portals or start pages are webpages that can be customised and personalised using widgets. 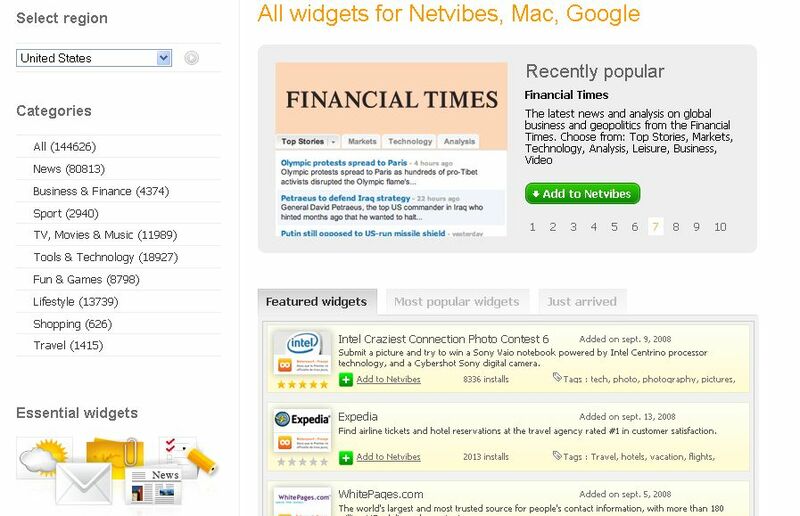 Popular start pages include Netvibes and Pageflakes which allow users to customise and change the information they can see. Most start pages earn revenue thorough advertising or sponsorship deals and many companies like Yahoo! and Google are investing heavily in making their own personalised start pages. Opportunities for Vodafone include charging for portal access and using these websites as a source of research. Web Portals or personal start pages are webpages that provide users with a customisable webpage where they can mix and match their favourites bits of information onto a single page. Web portals have been around since the mid 90's and some good early examples of webportals include Yahoo! and Excite. During the dot com bust, many of these early webportal companies were bought over, forced to merge or declared bankrupt. Functionality - It should be stable and do what its suppose to do it. AJAX or similar technologies now power these webpages. What this brings to the web portal is customisability in the form of widgets. Widgets, as previously covered in the widgets section of this wiki, are essentially mini-windows within the webpage itself which can be browsed and updated independent of each other. This also means increased interactivity on the webpage. Faster broadband means that the pages now load faster and more widgets can be added on without interfering with the browsing experience. In early portals like Yahoo, it was Yahoo that determined what was relevant or irrelevant. Of course, not everyone wanted to see stockmarket figures or the latest fashion trends but this was shown on Yahoo any. As time went by, users demanded more control over what information they see. Webportals are now designed with the user in control. So users decide what they want to see on their web portal while the company suggests what can appear.This makes web portals much more user friendly, customisable and appealing to the user. Previously, the applications or widgets that run on these pages were created by the company themselves. Now however, anyone with programming knowledge can create a widget for themselves. The effect of allowing open development is twofold; first it creates a sense of collaboration and community with the user while secondly, this provides a way of supplementing the company's services without additional costs. Netvibes is a personalised portal page that has been around since 2005 and is probably the most successful web portals around. If you visit the official website above, you can immediately try it out yourself. Netvibes also has the Netvibes Ecosystem which is a widget directory just for Netvibes. As you can see, there are over 14 thousand widgets many of which are designed by users. You can also create a public Netvibes page for other people to view and connect up with other users just like a social network website like Facebook. As Crunchbase reports, Netvibes earns revenue through 'content deals with third-party widgets and through fees taken for better-targeted information on Netvibes users'. For example, a company like Google will pay Netvibes to promote their widget as well as for information on widget usage and adoption. Companies can also buy a Universe which is a Netvibes page containing a collection of widgets specifically made for those companies. Netvibes also has a iPhone version and announced in April 2008 that they will open source their widget platform, application programming interfaces and iPhone version which is part of allowing users to contribute to the development process. Sponsorship - Netvibes is sponsored by the widget creators like TIMES magazine or Google. The creators benefit because it drives more traffic to their websites or increases user's brand awareness. Pageflakes allows users to add other users as friends on your Pageflakes account and track their activity just like on any social networking website. Sponsorship - Like Netvibes, Pageflakes is sponsored by the widget creators. The creators benefit because it drives more traffic to their websites or increases user's brand awareness. Advertising - As seen in the screenshots, Pageflakes has a 'sponsored content' box which displays ads. There is no way to shift or change the advertisement box. 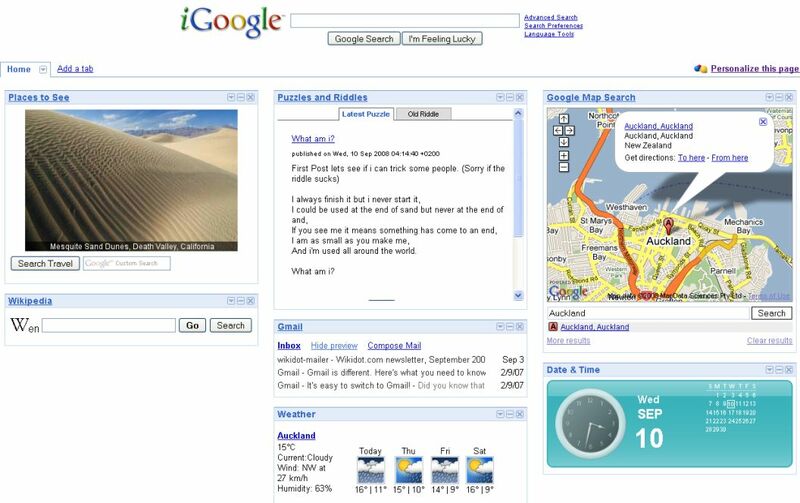 iGoogle is Google's version of a webportal and is part of any Google user account. 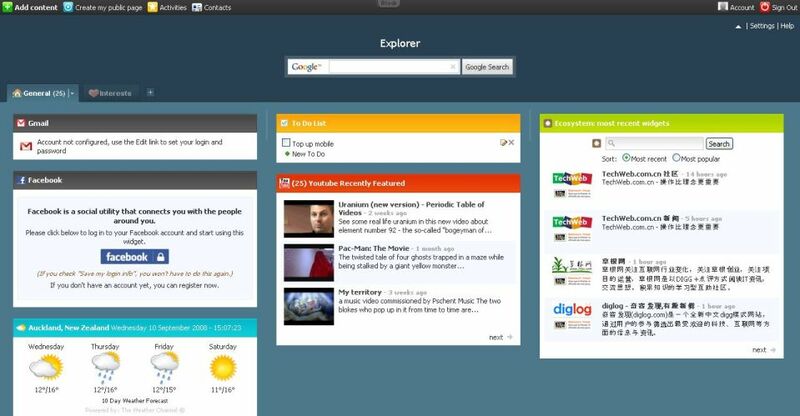 Like Pageflakes and Netvibes, iGoogle has plenty of widgets created by users. Advertising - Since iGoogle is closely integrated with the Google search engine, iGoogle is sponsored by ads that appear whenever you search with Google. Due to the customisability and personalisation, web portals and personalised start pages have become very popular with internet users with the last couple of years. Web portals or start pages are meant to be the first page a user sees when they open up their web browser so it is unsurprising that even major companies like Microsoft, Yahoo and Google have put in time and effort into their own start pages in an attempt to attract more users. Like any website which gives users more control over what they can see, a more accurate picture emerges of users behaviour. At the same time, those who create widgets to run on these start pages can provide the users with a true multimedia experience. Lack of differentiation - Although there are plenty of web portals, many of them have functionally identical. As you may have noticed from the examples above there are few major differences and it comes down more to appearance, ease of user interface and community contributions. For example, all of them will have a Youtube widget or Google widget that function exactly the same. Speed issues - Due to the multimedia nature of portals, it can take a while to load up pages with lots of widgets on them. Market Saturation - With so many choices and many big companies like Yahoo and Google competing, it is hard for new companies to break new ground or existing companies to convince other users to change their start page. Much of the increase in users are people who are new to start pages. The previous online articles on gaming and social network provides some insight into how web portals are getting over these problems and the future of their development. For example, Netvibes and Pageflakes now give users the ability to create a public page, share information and track other users' activities a clear side that they are becoming similar to social network websites like Facebook. Perhaps in the future we will might see start pages which incorporate a customisable avatar and the ability to purchase virtual items in a virtual shop. What does this mean for the industry as whole? We currently see the industry dominated by a couple of main companies such as Netvibes, Pageflakes and iGoogle and a few smaller companies fighting for the rest of the marketshare. Companies like Yahoo which use the traditional form of the webportal are forced to change or die out. We also see an increase in user engagement where users are experimenting with creating their own webpages. The next level of this is of course the widget desktop like Google Desktop where widgets appear on your desktop. Vodafone could look at advertising on a start page or web portal using traditional banner advertisements. Vodafone could look at creating widgets for a start page that link their mobile phone account with their start page. Vodafone could also look at creating widgets are for both PC and mobile phone. As Netvibes and Pakeflakes become valuable tools for users, Vodafone could look at charging portal access to use start pages on a mobile phone. A portal netvibes is very similar to something like the Vodafone mobile Live! portal we have in New Zealand. Vodafone could look at web portals like Netvibes or Pageflakes as sources. Furthermore, how users interact with their own personalised pages are also useful. Vodafone could look at creating a homepage like the BBC homepage which is highly customisable. At the same time, Vodafone could place useful Vodafone widgets on the main webpage for users to adopt. Using personalised start page technologies for an intranet start page can be extremely beneficial as the employees will be able to organise information the way they want it and additional modules can easily be created. In fact one of the areas which Read Write Web web portal companies might want to look at is actually selling their technology to businesses. Who will win the web portal wars? With so much money being spent on web portals and widgets, who will dominate the 'entrance to the internet' and how will this affect the dominant player Google? 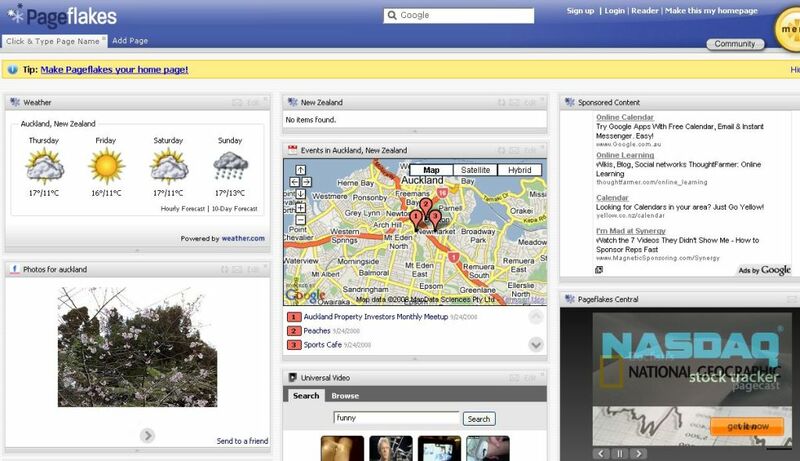 How will the changes of the start page affect other websites like Facebook? With the changes that are social network changes occurring on Netvibes and Pageflakes, how will this affect Facebook and other similar websites with customisable pages? What are the long term implications of this form web interface? As users become even more comfortable with altering webpages how will this affect the future of web browsing. Will the term 'browse' still be relevant 10 years from now? Web portals or start pages are webpages that can be customised and personalised using widgets. Examples of older web portals include Yahoo! and Excite where information was static and decided by the provider. Web 2.0 start pages are characterised by greater customisability and the ability to create your own widgets leading to greater user involvement. Popular personalised start pages are Netvibes and Pageflakes which have plenty of widgets. Start pages like Netvibes and Pageflakes are now also include the ability to keep track of your friends and share information with others much like social networking profiles. Most start pages are sponsored by widget creators like Google. Start pages are very popular and as more and more users come to adopt start pages, we must consider the impact start pages are having on user behaviour and expectations about the internet. Vodafone could look at charging for access to these pages on a mobile and using these start pages as sources for research.